Standing under the shade of a large tree, I decided to concentrate on the vast industrial complex to the east of our spot (I presume that it’s Chevron and other chemical plants). The pattern of train lines and freeways was fascinating and speeding cars were so tiny and fast I decided to leave them out. The industrial colors were also quite beautiful when viewed from this distance and I really enjoying applying the paint on this day, without worrying about it looking fake. I may add more to this because I didn’t complete the hills on the horizon and far distance but I suspect that I might overdo it again and am tempted to leave this as it is. 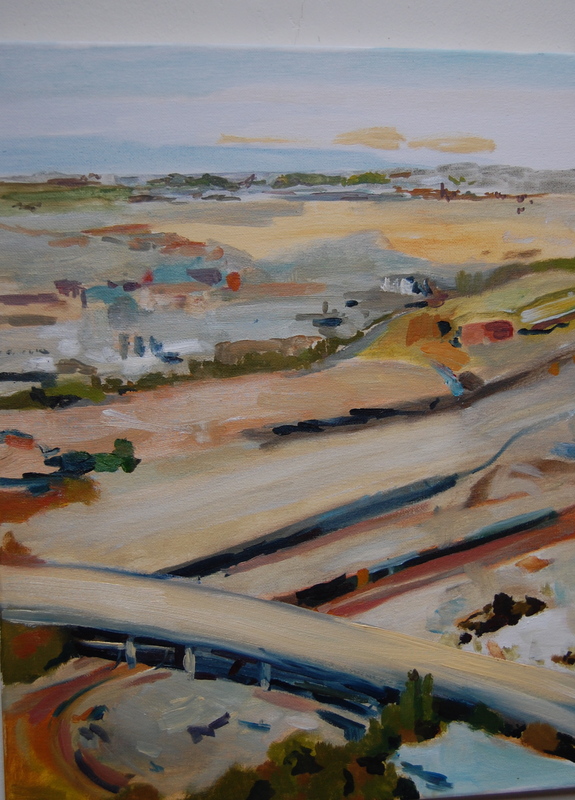 This entry was posted in Uncategorized and tagged Chevron, Fran Osborne, landscape, oils, Point Richmond. Bookmark the permalink. ← Blake Garden, Kensington, CA.